The story begins with a group of high school students entering a different dimension/world. The main male character awakens a female robot/witch by using her wand/staff which is key shaped at the end to turn on the spring on her back. When the female robot/witch first saw him, she said something like "Are you my new master? You seem like a great guy. I'm glad." The female robot/witch lost her memory and was used by an evil person and listened to the evil person and used her power trying to destroy the world. But the female robot/witch is a good person deep down inside her heart. The other females characters from the magical dimension have power to manipulate elements like wind, water, and fire with a ring or bracelet. 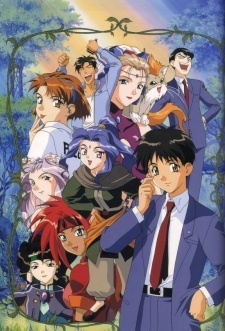 I watched this anime in the 90s, does anyone know what it is? This sounds very much like El-Hazard. There's a "demon god" (ancient super-tech robot) named Ifurita who is awoken and controlled by the staff, and three priestesses with elemental powers. Other elements that you might find familiar if this is the one you're thinking of: an Arabian Nights aesthetic, invading bug-people, kilometers-high towers distributed across the landscape, a giant spherical moon hovering in the sky. When Makoto Mizuhara discovers an old monument in his school and awakens a beautiful woman he, his teacher, his worst enemy and one of his female friends is transported to the magnificent world of El Hazard. There they discovers that they have received special powers. Makoto and his teacher Fujisawa land in a jungle and save a princess from very large bugs. Makoto's friend Nanami lands in a desert. And Makoto's rival, Jinnai, lands in the middle of the bug's kingdom and becomes their general, plotting to destroy Makoto and his new friends. After having his attacks repelled by Makoto several times, Jinnai learns about an ultimate weapon, the demon Ifurita. Everyone sets out to find it, and when they do Makoto learns that she is the same woman that sent them to El Hazard. But the one gaining control of her is Jinnai.